So you're in this 4% of punters who make money (only 4!!) @ 20% profit on bets, so if we assume you're rockafella and place £10,000 a month in bets, that's only £2000 a month profit (not enough to justify doing it full time) and they are all banning you?! Come on mate, even if you weren't talking bollox about your winnings surely you can see it's a rigged game. How can you advocate participation? My business is my business. I know how it works and it does. Just because you’ve experienced blokes in a pub caning money on a regular basis because they’ve spent 30 seconds research per bet and probably none in trying to change their overs strategy doesn’t mean it applies to everyone. The time I spend placing bets probably amounts to about 30 minutes or more. I don’t have BOG but do have bookies I can use. 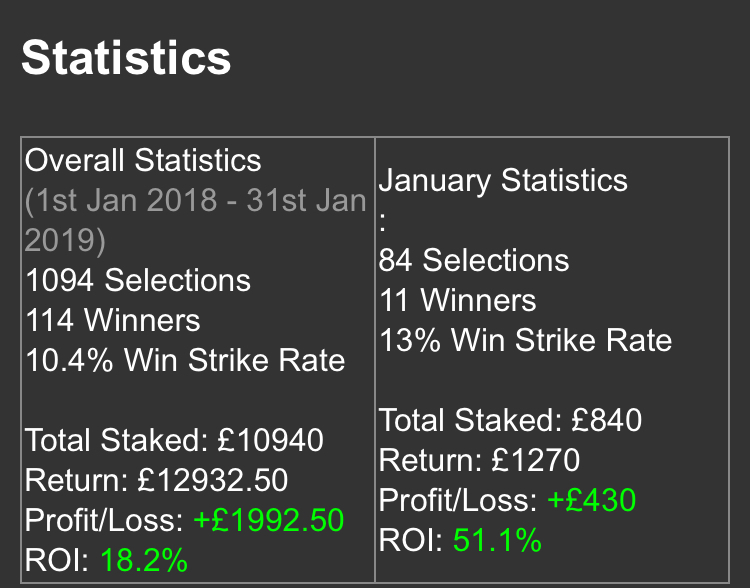 I’d be concerned if my ROI was very low but it isn’t and there’s also the exchange for higher odds where you can claw back what you didn’t make with BOG by taking price at the time or BFSP Betfair Starting Price. This is where the longer term punter can nullify this. I also rarely go each way because win only is better longer term. Believe what you like. It makes no difference to me. You sound like what you are: someone with a gambling problem trying to justify their irrational position. You could very easily prove your point and me wrong by simply screenshotting your account. It would take far less than half an hour: you could even do it next time you log on to check your ROI and not expend any additional effort at all. You won't do this, not through any genuine sense of defiance driven by pride, but because you are in all probability fibbing. Righto. You may be gaining some satisfaction in annoying other people in the short time you’ve been on HOL but you won’t me. I don’t need to justify myself to someone who knows naff all about any of this. This geezer is free. One of the several I use. Not even paid for, so think about the paid for ones as well. One of the several you use? So how does this work, do you give him your money and they lay the bet then, or do they give you tips and you go off and lay the bet? That graphic looks like you hold an account directly with this entity. The ROI bit concerns me. If you've subscribed to a service where you put money in and the 'tipster' handles the placing of the bets and gives you a return on your investment, you're not gambling mate, you're in a Ponzi scheme FFS! Cut and run before you get shafted. This type of return on "investment" is never free. I place my own bets. I know you’re finding this hard to accept but just do. The information is either free or on average £30 per month. I give the tipster nothing more. So where does the ROI information come from then? FFS man, from tips provided. Returns from winning bets at recorded advised stakes divided by Number of bets placed x flat stakes x 100. I can’t be fvcked with this any more.